Each contestant kindly added a few words explaining their pick. In case you missed it Round 1 can be found here. With that let’s go down round 2. Now I have a dilemma. Who is going to be my guard? 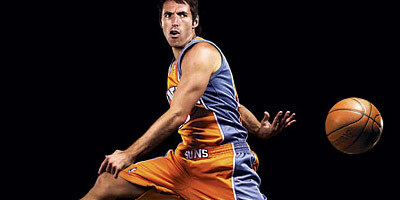 As much as I like Dwayne Wade, I have to go with Steve Nash. Nash is the best passer, best shooter from all over the court, and also has a high IQ. On defense I might have a little bit of a problem, but there’s not much difference between Nash’s defense and Paul’s defense (and Nash is better than Paul at shooting). 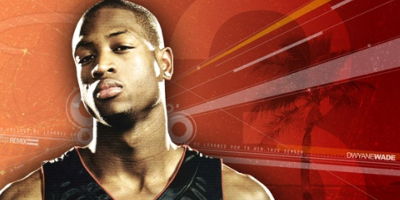 I pass on Wade because he can’t shoot from long range. I’m going with who I think is the best big man available in a 3-on-3 setting. While he’s not quite as productive defensively as some of the other obvious choices, interior and help defense won’t be quite as important in a game of 3-on-3, and he’s definitely the most explosive offensively. Paired with Chris Paul in the pick and roll, I don’t think anyone will be able to stop Blake Griffin. Seriously? I thought I was going to have to struggle here. It becomes really academic for me then. With the ninth pick I take the best guard on the board. Dwyane Wade come on down. Two picks, two best players at their position. Wow. I’ve been holding my breath here. 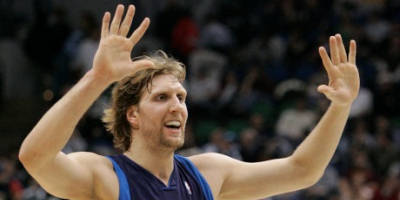 I take Dirk Nowitzki with my pick. I get rebounding and a fantastic 3 shooter. Furthermore, in this format players will try to guard the 3 heavily but both my players are very tall and very quick shooters that are very tough to guard and probably nearly impossible for the point guards to deny the 3. Pretty thrilled with this pick. 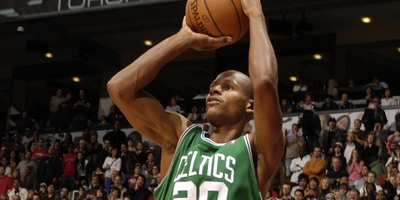 I have struggled a lot with this pick, but I’m going with Ray Allen. With LeBron there to penetrate and handle the ball, and with 3-pointers being worth much more than usual, the importance of a great shooter is exacerbated a great deal. Allen is arguably the best 3 shooter in the world. Additionally, he takes care of the ball and doesn’t force shots. At least, not as much as other unnamed 2-guards. Allen is also an underrated athlete, and can actually penetrate and defend fairly well. Plus he has a great basketball IQ. But he’s on my team for one primary reason: to drill 3s. In my experience with 3-on-3 ball, team chemistry and complimentary skill sets are about as important as skill level (in 5-on-5 skill more often trumps). Ginobili is primarily an offensive pick, since he is probably the best at attacking the basket of any guard remaining. Though there might be better players available (shouldn’t someone be taking Kobe by now? 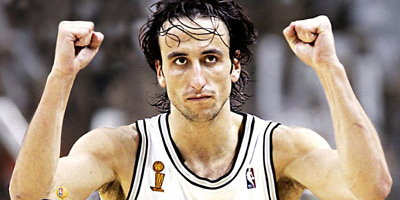 ), Ginobili is a good fit. We’ll wrap up tomorrow with the final two picks for each contestant. Feel free to let us know your thoughts on our picks! 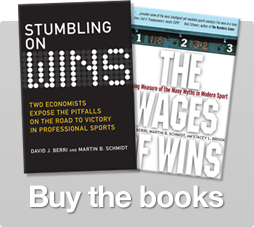 2 Responses to "The Wages of Wins 3 on 3 Fantasy Draft Round 2"